obscene chewing: the sound and the fieri. 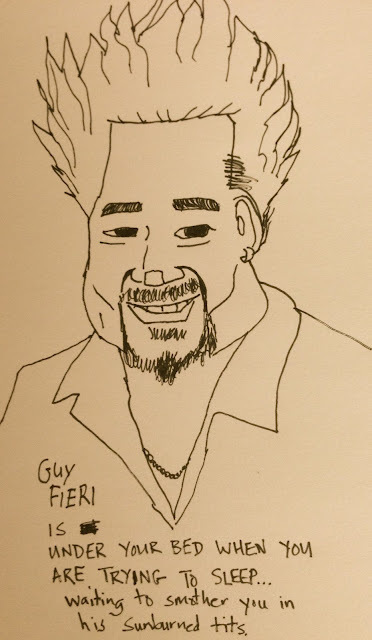 In order to commemorate the New York Times' catty review of Guy Fieri's restaurant in Time Square—which apparently qualifies as major news in this strange world we live in—I decided to do some beautiful art (see above) for your entertainment. The review complained that his toasted marshmallows (not a euphemism) tasted like fish. That's because they dab them in the dewy clefts of Fieri's groin after he walks up five flights of stairs. It's the secret recipe. The question no one bothered to ask was why toasted marshmallows are being served in a restaurant in the first place. Exactly what else is on the menu? Cookie dough batter and sour cream and onion Pringles? I should add, I am now afraid to go to sleep tonight. Thanks.